Noom Health, the B2B branch of Noom's product, integrated a feature which allowed the user to use an external cuff device to keep track of their blood pressure on a daily basis. The information would then be relayed to a doctor, who would look out for any unusual trends in the patients data. 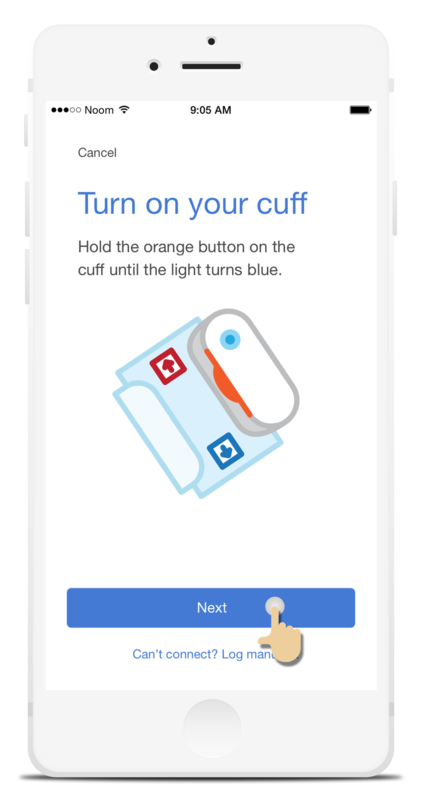 Working with a project manager, I created the UX and UI for pairing with the external device, and recording the data collected by the blood pressure cuff. I also illustrated the icons for instruction on how to properly use the external device. Given the demographic of the intended user, those most prone to congestive heart failure, we had to be as clear as possible with the instructions for using the device, and properly storing the data. From the Do More Drawer, users can select the option to check their blood pressure. The blood pressure cuff connects with the app via bluetooth, requiring the user to make sure they have bluetooth enabled. Because the intended audience for the product was those most prone to congestive heart failure, those over 55, we had to be pretty explicit with our instructions. Created clear and simple icons for demonstrating how to appropriately measure blood pressure. Here the user gets their blood pressure reading, which upon saving is forwarded to their doctors patient dashboard, and notifies the doctor of anything unusual. Here it can be seen that the task has been completed as a part of your daily activities.